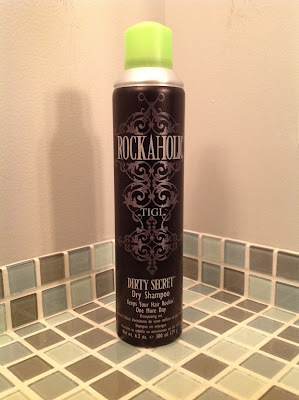 I am a huge fan of dry shampoo! It works wonders for my medium length, fine, straight hair. I have a hard time creating any volume and my hair tends to get greasy looking around my face if I skip a day of washing, which I often do. That's were good 'ol dry shampoo comes to the rescue. It helps give my hair volume, takes away the oily look, and allows me to skip washes which equals, easier styling,and less heat damage. I have been a fan of Tressemme dry shampoo, but the last time I ran out I picked up TIGI's Dirty Secret dry shampoo. It's a favorite among many, so I decided to see what the hype was about. I picked up a 6.3oz aerosol spray can. It's black with a green cap and has, "Keeps Your Hair Rockin' One More Day ", written on the front. I believe it was around $12.00. To use, you just spray at the roots and shake well between sprays. My first time spraying it onto my hair I was not convinced. I compared it to Tressemme's in which you can see a white film on your hair before you brush the product through. No white film here, and no brushing required to work it in. After a few uses I realized, that's a good thing! No powdery white film to brush through, just results. It gave me the bit of lift I was seeking, it took away the greasy look, gave some texture, and even made my hair more manageable. Overall, Dirty Secret dry shampoo works really well on my hair and I've already repurchased it after running out. I now chose this over Tressemme, and I am looking forward to trying some more of their Rockaholic line. This looks nice! I've only ever used Batiste dry shampoo, but I don't like to use it so much anymore because of the smell! I can always tell when other people are wearing it as it's such a distinctive smell! Love your blog! Just followed you! I saw Batiste Dry Shampoo the last time I was at Urban Outfitters and was curious about it. Thanks for the warning about the smell because I almost bought it. The dirty secret has a pleasant smell if anything :) Thanks for following. I'll be checking out your blog next. Thanks! Thanks Ashley! I'll be checking out your blog as well.